Let's work through a halogenation reaction. Draw the structures for each of the species in the four boxes below (3º carbocation, halonium ion, protonated thiol, and thiol). Also draw curved arrows to show electron movement. Note: thiol = RSH, like an alcohol, but with sulfur instead of oxygen. Because the chlorine is more electronegative than iodine, the iodine will have a partial positive charge and will be attacked by the alkene. It forms the more stable carbocation as normal (as in problem 335). The nucleophile (HSCH2CH3) will eventually attack the carbocation, but the iodine does something special first- it forms a cyclic intermediate. 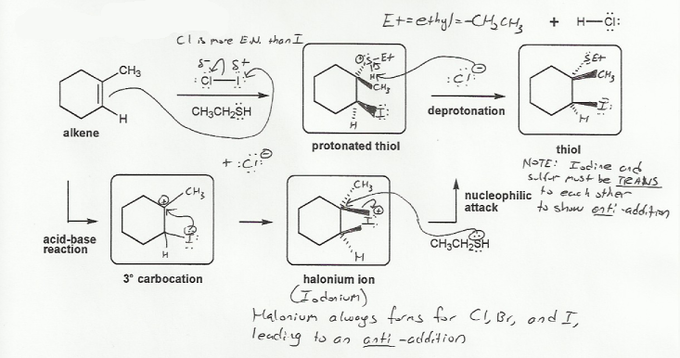 The formation of the cyclic halonium ion is probably the most important concept you will learn in first semester organic chemistry. With iodine, it's called an iodonium ion. (with chlorine or bromine, it's called a chloronium or bromonium ion). The HSCH2CH3 will attack the carbon that was the carbocation, but it's forced to attack from the side opposite to that of the iodine. So the product will always have anti stereochemistry (you get the trans product). MendelSet practice problem # 521 submitted by Matt on July 1, 2011.